It was Richard Muir’s book The Lost Villages of Britain that got me hooked on the topic of abandoned communities. Near the end of the book Richard gave a short list of some of his favourite deserted villages. 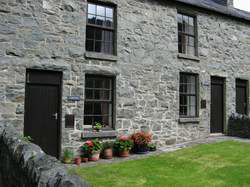 He then said that there is one village, Porth y Nant, that has all the ideal qualities combined to produce perfection. 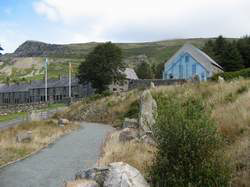 He regarded it as a place “glorious in its beauty”, and he was impressed by the fact that it was about to be restored and turned into a centre for the promotion and teaching of the Welsh language. Porth y Nant lay in a small valley, Nant Gwrtheyrn, that runs down the lower slopes of Yr Eifl mountain towards the sea. 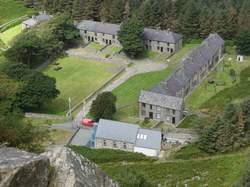 The location of Porth y Nant can be found on Google Maps by entering “Nant Gwrtheyrn”. In the aerial view you can make out the original track running through the modern conifer forest as well as the present road. What the aerial view does not convey is the extreme steepness of the original track, in places one in three. 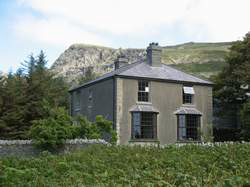 In the middle of the nineteenth century there were three farms in Nant Gwrtheyrn. 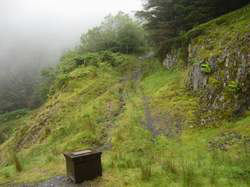 A granite quarry called Porth y Nant was opened in 1861. It was opened by a Liverpool company called Kneeshaw and Lupton. The main output was rectangular granite setts, carved into shape at the quarry. At that time there was great demand for setts for use in paving the roads of the towns and cities of Lancashire. A jetty was built so that steam ships could carry the setts by sea to Liverpool, Manchester, or Birkenhead. Soon after the opening of the quarry a terrace of small houses was built to provide accommodation for the workers. Later, in 1878, as workers were joined by wives, partners, and children, two more terraces of houses were built at right angles to each other further up the valley. One was known as Sea View as it faced west towards the beach, the other Mountain View as it looked towards the mountain and the quarry. Other buildings erected at about the same time were the Plas, a large house for the quarry manager west of Mountain View, and a chapel of the Calvinistic Methodist denomination. • Vortigern, a fifth century British ruler whose attempts to negotiate with the invading Saxons went badly wrong. According to the local legend he was forced to flee and eventually found refuge in the valley that was given his name, Gwrtheyrn being the Welsh form of Vortigern. For everything you will ever want to know about Vortigern go to the Vortigern Studies website. • Rhys and Meinir, two cousins who fell in love and arranged to be married at the church in Clynnog Fawr (a place well worth a visit, by the way). Meinir failed to turn up for the wedding. In a distressed state Rhys spent months searching for Meinir, until a lightning strike opened a hollow tree and inside it he saw the skeleton of Meinir, still clad in its wedding dress. • Ellis Bach, so called because of his very short stature, who as well as being a very good poet was renowned for his ability to climb over rough mountain slopes. He could be relied upon to round up sheep and goats ready for market day, but on the day itself was never to be seen.